Soak cashews in hot water for 30 minutes, then drain. Add cashews, vinegar, lemon, water, and salt to a blender or food processor, and blend until smooth. Add avocado, lemon, salt, and oil to a blender or food processor and mix until smooth. 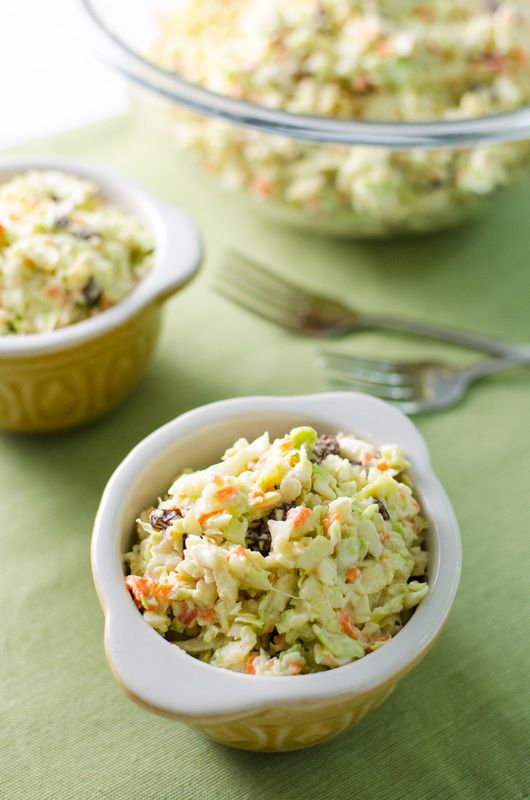 Shred cabbage in food processor and transfer to a large mixing bowl. Replace shredding disc with S-blade and add baby carrots to food processor. Pulse until carrots are finely chopped. Scrape carrots into the mixing bowl. Add onion to food processor and pulse until finely chopped. Scrape onion into the mixing bowl. Replace S blade with shredding disc, shred apples and add to mixing bowl. Add raisins to mixing bowl and stir to mix ingredients. Mix avocado mayo, mustard, salt, pepper, and maple syrup with cashew sour cream, and add to mixing bowl. Serve immediately, or refrigerate for up to two days.